I recently led a webinar on strategy and innovation for Chief Executive Magazine and 300+ CEOs. Throughout the program, I used polling questions to gauge their perspectives on three strategy topics and wanted to share the results with you. Question 1: How often do you and your team meet to update your strategies? An overwhelming majority of the CEOs (83.6%) said they meet 0-4 times a year to update their strategies, with nearly half (42.3%) meeting only once or not at all. Research has clearly shown the number one driver of revenue growth is the reallocation of resources throughout the year from underperforming initiatives to ones with greater success. The reallocation of resources that is critical to success simply won’t happen if leaders aren’t meeting on a periodic basis to make these types of decisions. I’ve worked with dozens of companies to implement Strategy Tune-up sessions to provide their leadership teams with a concise, yet comprehensive forum to review goals, objectives, strategies, tactics and metrics. How often is your leadership team meeting to discuss strategies separately from budget, operations and tactics? Question 2: What’s the top strategy challenge your company faces? The number one challenge CEOs cited is, “being reactive and tactical” at 33.9%. CEOs place a high value on those managers that don’t react like a bumper car to everything that comes their way. Instead of vaulting into action with each new factor, strategic managers are more likely to say, “Let’s stop and think about that.” A phrase as simple as this triggers people to avoid reactive behavior and consider their options before acting. The second strategy challenged identified by CEOs is, “discipline to commit time,” at 22.6%. With the increasing pace of business, it’s difficult to jump off the activity tread mill and spend quality time thinking about the business. In my experience as a strategic adviser to senior leaders, I’ve found that unless a leader is willing to carve out both group and individual think time on their calendar, it will not happen. The average CEO only spends about 11% of their time alone thinking about the business. The cultural trap is that if the CEO and other senior leaders don’t invest time thinking, no one else will. The third strategy challenge is a “lack of alignment on strategies” at 18.3%. In companies of all sizes, silos are established inhibiting the flow of communication and insights across various functional groups and levels. One of the primary roles of leaders today is to bring people together on a regular basis to discuss business issues and understand how they can support one another. A key element of this task is to become aware of other’s priorities and share your priorities in order to find common ground for strategy alignment. Question 3: What is the percentage of managers in your company that are strong at strategic thinking? A whopping 81.4% of CEOs indicated that less than half of their managers are strong at strategic thinking. When you consider that the number one cause of business failure is bad strategy, having a vast majority of managers that are not strategic puts your company at a much higher risk of becoming obsolete. It’s no coincidence that CEOs said their number one strategy challenge is “being reactive and tactical,” when so many of the people that report to them are not strategic thinkers. 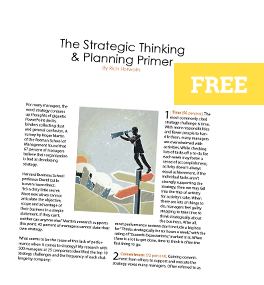 In leading strategic thinking workshops around the world, I’ve seen managers increase their strategic thinking capabilities more than 30% by learning the fundamentals of strategy and how to apply it to their daily work. CEOs realize that strategy is a key component of their company’s long-term success. But, as these results show, not all CEOs are committed to a disciplined approach to transforming strategy from an annual dog-and-pony show into daily activities, behaviors and habits. These are the CEOs who will have the word “former” inserted at the front of their title sooner rather than later.